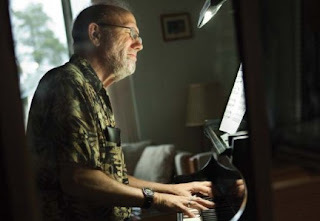 The weekly Kurzweil AI Newsletter steered me to this great article on composer and musical creativity researcher David Cope (here's a 2009 NPR interview with him). Cope is a composer who has spent many years developing software to help him explore and understand musical creativity. The software he developed (EMI or Emmy, and his newest creation, Emily Howell) actually composes music. Cope's basic hypothesis on musical creativity is that it is fundamentally imitation and redeployment of music the composer has heard before. His first program (EMI, mp3 samples here) was based on the analysis of many pieces of music to extract what you might call the style of the original composer, though it really goes deeper than style to include sources and influences. EMI (Experiments in Musical Intelligence) could then create new pieces of music in that style (or combination of styles), music that was often considered by experts to be of high quality and practically indistinguishable from music by the original composer - until they were told that the composer was a computer, after which they judged the music to be derivative and mechanical, as well as relatively uninteresting since they are new works written in old styles (e.g., Bach). Emily Howell in some ways seems like a new interactive "front end" for EMI. Using it, Cope communicates musical ideas and goals. The software responds to these goals with modifications to the music "under construction" (it uses the output from EMI as its musical source material). In this way, composition becomes much more of a collaborative process between Cope and Emily Howell, and the results are rather impressive, based on the samples I have heard, with a sound more like modern music than re-fried classics. Emily Howell's first album is supposed to be released soon on Centaur Records. As a songwriter (but definitely not a "composer"), I find this cool and exciting. It's really just taking musical tools to a new level. In their early days, synthesizers and sequencers were considered to be threats to studio musicians and orchestral players, but they have truly expanded the palette of tools that musicians have available (though I'm sure some musical jobs have been lost or displaced in the process, while others have been created). I write most of my songs with a guitar or keyboard and record most of them with the help of a talented (human) producer and musician who can arrange things I can't arrange and play things I can't play. In addition to recording software (SONAR), I sometimes make use of a program called Band-in-a-Box which generates fairly sophisticated automatic accompaniment through MIDI-based synthesizer voices. These are great for demos and they have inspired some of my best songs by allowing me to easily play around with different styles,arrangements, and instruments. I'd be happy to work with a smarter version of BIAB (like Emily Howell) if it becomes available at an affordable price. I occasionally read the funny/nerdy comic xkcd. I saw this drawing of "the observable universe from top to bottom" ("Height") a long time ago and have always wanted to blog something about it. So here it is. Be sure to click the small image and scroll to examine all the funny bits visible at full scale. Heights above the Earth's surface are accurate on a log scale. You can also buy a poster of this from the artist. P.S. Looks like I wrote about this in 2008 too. Oops. It's cool enough to blog twice. I really go back and forth on this. I've been a member of the Mars Society since 2005, I've read several of Robert Zubrin's books, and I even attended and presented a paper at the 2006 Mars Society Conference. I've spent a lot of time reading and simulating and thinking about Mars, and there's no doubt that as a non-Earth destination, Mars is as good as it gets in this particular star system. So when I read Bob Zubrin's latest essay on why NASA needs a human spaceflight destination, and why that destination needs to be Mars, I want to believe. On some level, I do believe. I was a child of Apollo (and the Beatles) and I probably became an engineer because of it. I was inspired. Developing technologies that will someday be great building blocks for some TBD exploration program (as in the current Obama proposal for NASA) - that's maybe practical, but it's sure not inspirational. Developing a commercial space industry is an essential step in becoming a space-faring civilization, and it will probably create some pretty good high-tech jobs in the USA, but it's probably not inspirational at anywhere near the Apollo level. On the other hand, Apollo was exceptionally non-sustainable, a proxy-for-war crash program to beat the Soviets to the Moon, and given the political climate and the cost of the Vietnam War, we were damn lucky that we got up to Apollo 17 - I'm sure there were plenty of people in Washington ready to pull the plug as soon as Neil and Buzz splashed down. It surely inspired a lot of people and left a legacy of technology that fueled the US economy for many years. But there's no single threat at the level of the Cold War around which you could build a political consensus for an intense Mars-focused program right now (unless you could somehow show that this would reduce short-term unemployment). I guess I'm really hoping that the analogies between the early aviation industry and the early commercial space industry will come true. That someone will develop the DC-3 and later the 707 and 747 of commercial space, and that from these developments, the path to Mars (and to the Moon and the asteroids) will become clearer and easier than it is now. But is that a realistic hope? I don't know. Probably not in my lifetime (guess I better work on extending that). Then there's the whole Lifeboat thing. What if we "sink" this planet? Yeah, I don't know. It's definitely easier to just have a glass of wine and watch American Idol. But I'm trying to avoid that (the Idol part anyway). JFK's let's-go-to-the-moon-in-this-decade battle cry it isn't. But in some ways it's even more exciting, because it points the way to truly sustainable development in space. The picture above shows Elon Musk of SpaceX standing by his company's Falcon 9 launch vehicle which will launch for the first time this spring. The Beatles have been one of my favorite bands since I first started listening to them in 1967 (yes, I was a few years late to the party - the first Beatles record I bought was the single "Hello Goodbye" b/w "I Am The Walrus" in December 1967). Recently I've been on a Beatles nostalgia kick, triggered by two books I've been reading, Can't Buy Me Love by Jonathan Gould and Revolution in the Head: The Beatles' Records and the Sixties by Ian MacDonald. Of course I've read a lot of things about the Beatles over the years, but these books are especially enjoyable because they focus on the cultural context and on the songs. Gould's book is something of a cultural history of the 50's and 60's with fairly detailed descriptions of the Beatles' songs and albums as well as their musical influences. MacDonald's book (which I actually just got) is more of a detailed, critical song-by-song analysis, and while much of their music was amazing, this author's not afraid to point out that some of what the Beatles put out was actually pretty crappy (good example: Harrison's "Blue Jay Way," though I have to admit I listened to it a zillion times back in the day and still know it by heart - "Magical Mystery Tour" was the first Beatles album I bought - what did I know?). I've been reading Can't Buy Me Love on my iPod Touch (Kindle e-book), and it's really cool to be able to quickly pull up and listen to any song he's discussing since I have all the Beatles' songs on there. Ain't technology great sometimes? It was also cool that in the early part of the book, when Gould was writing about the boys' time in Liverpool, that I could think back to the "Magical Mystery (Bus) Tour" that I took there back in 2008. We even stopped in front of the church where John and Paul met in 1957. 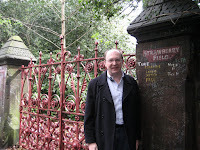 That's me in front of the Strawberry Field gate. With the changes underway in its mission and funding, I'm not sure if there will be a Lunar Electric Rover in NASA's future, but you can still learn about it and "drive" it in a free iPhone/iPod Touch app that's now available. It's not the most exciting game you'll find for the iPhone, but the graphics and background info are pretty cool. 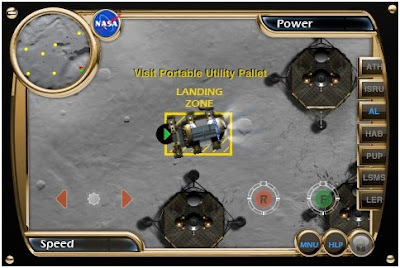 It's available from the iTunes App Store (search for NASA Lunar Electric Rover Simulator). I just learned about 3D Sun, a new free app for iPhone and iPod Touch. It uses data from NASA's STEREO solar observation satellites to produce a zoomable, spinnable, false-color image of the sun in several selectable wavelengths, updated on a daily basis. 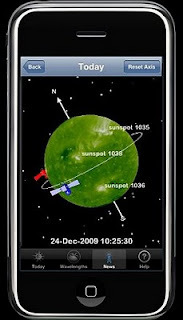 It also provides news and alerts on solar events. I downloaded it and tried it out - it's pretty cool considering you're holding the sun in the palm of your hand. I've missed a few space carnivals the last couple of months, and time marches on - we're up to carnival number 141! This week it's hosted by Starry Critters which is a pretty cool blog. 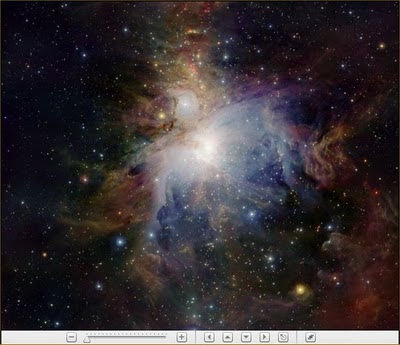 It features many images from Hubble, Spitzer, and other telescopes, chosen for their resemblance to plants or animals, and presented in zoomable and pannable Flash viewers in each blog post. The one above is from a February 11 post, titled "Flower of Orion" (taken by ESO's ground-based VISTA survey telescope). I'm still in the "gravity well" of the international meeting that I organize every February, but I'm slowly climbing out of it. Everything went well last week, including the off-site entertainment day which this year was at the Disney Resort in Anaheim, California, my first trip to Disneyland in quite a few years. It was fun - I did a couple of the nostalgic space-themed rides like Space Mountain (really just a roller coaster in the dark) and Star Tours (a full motion simulator ride). But the best thing I saw was a "live" stage show demonstration featuring Honda's humanoid robot ASIMO. It walks, climbs stairs, stands on one foot, runs, and even dances. Pretty amazing. It apparently understands some voice commands, but it was hard to tell its abilities in this since the show was heavily scripted (if it wasn't heavily scripted, ASIMO is certainly ready to pass the Turing Test). 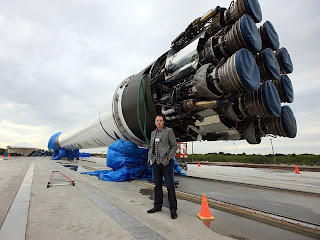 Lots of things have been happening in the space world while I've been on my blog vacation. Although there are a lot of uncertainties ahead for NASA under its new charter and budget, I agree with the general direction (even though some of it is more of a lack of direction). Nothing about space flight is anywhere near "routine," and the analogies with the early development of the aviation industry (air mail contracts leading to the early airline business) are not very exact. But if we are ever to be a space-faring civilization, government space agencies can't continue to run the whole show. Transferring the LEO business to commercial operators seems like the right thing to do. I've got a backlog of things to write about once I get my schedule more under control, including several really good books (all read on my iPod Touch - I'm mostly reading e-books these days). One was a SF book called Eifelheim by Michael Flynn, and another was Girls Like Us by Sheila Klein, a musical and cultural biography of Carole King, Joni Mitchell, and Carly Simon. I also have to mention a couple of flying notes. One is the free on-line book See How It Flies by John S. Denker. I discovered this back when I was taking flying lessons in the early 2000's. Denker is a physicist and a flight instructor and this book is an incredible merging of the scientific and technical with the practical aspects of flying airplanes. I rediscovered it this past week when I was moving my files to a new PC. I have some background in physics and flying and I still love both, though I do sadly little of either these days. Denker clearly has a deep knowledge of both, and his explanations and graphics are great. 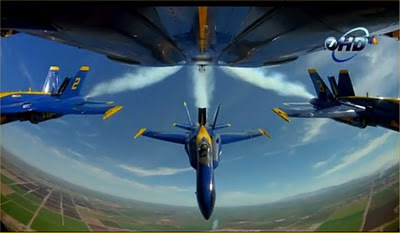 The final flying note is a video link sent by a friend, a 5 minute HD clip of the US Navy Blue Angels in action. I'm always a sucker for a great flying video. I've seen the Blues quite a few times, but this video gives some amazing perspectives on their art (that's a still frame above).